FOCUS – A minimal photography template with multiple concepts of showcase & gallery options perfect for every creative photographers websites. 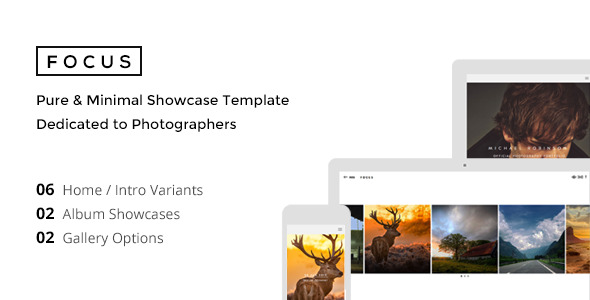 The template has highly unique features such as Infinite Grid album showcase with Touch & Drag interaction, Zoomer adaptive fullscreen gallery, Timeline panel, Slider Revolution, Ken Burns Effect, Isotope Masonry grids and more. Live preview images are from Unsplash and Flickr (by Fotuwe, Vonderauvisuals and CubaGallery). Live preview images are NOT included in the pack. We have generated placehold.it images instead. Need help to replace the placeholders? request the live preview image ZIP pack. The pack may include heavily blurred version of stock images used in the template. Font used in this template is – a premium Web Font used with special permission for usage in themeforest. Concept inspired from Jakob De Boer photography. Template Design & Coding by Team Designova.